Parachutists Before the Game - at the Air Force/Army game Saturday, a pre-game performance by parachutists from the Air Force Academy and West Point. 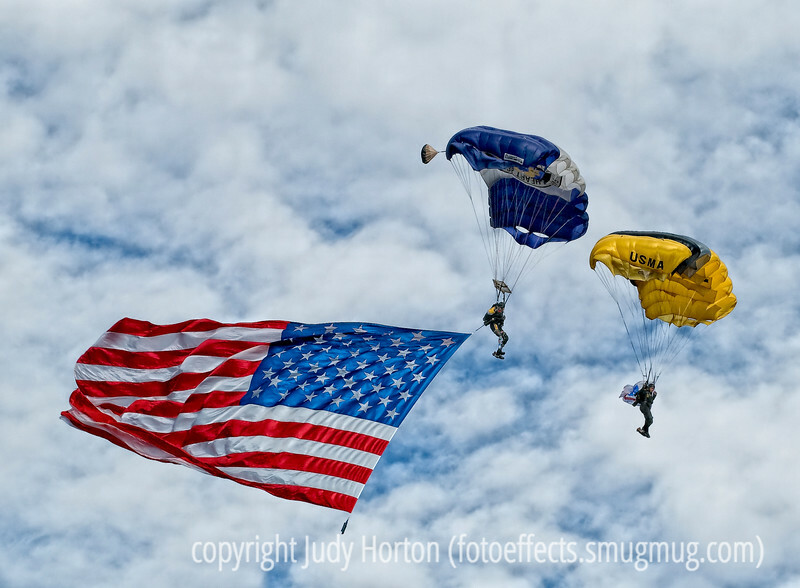 The man with the flag is a retired Air Force parachutist and a double amputee, who lost both legs in a mid-air collision with his partner, who died in the accident. The other parachutist in this shot is a West Point cadet. Please view this image in the largest sizes to see the detail of the parachutists, including the prothestics of the man with the flag. I was amazed at the response to my shot of part of our yard during a recent snowstorm. You all have made me consider using it as our Christmas card this year. Very nice. These parachute pics normally create terrible dynamic range issues, but you got some nice, even lighting here on a great composition. Fantastic sharp shot & a one of a kind, love it! Beautiful flag, God Bless America!!! I like the ripples and colors in the flag. Great image!